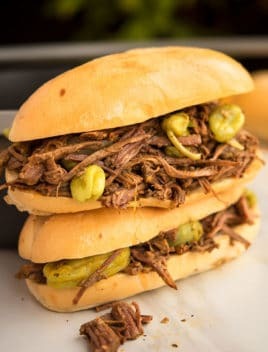 The best, tender, melt in your mouth, quick and easy Italian beef recipe, homemade with simple ingredients in Instant Pot. The beef is simmered broth and Italian herbs/ spices and great in Italian beef sandwiches. I love using roasts for meals and this one is always a hit with family and friends. It’s jut as good (if not, better) than my Instant Pot Shredded Beef and my Instant Pot Red Wine Pot Roast. 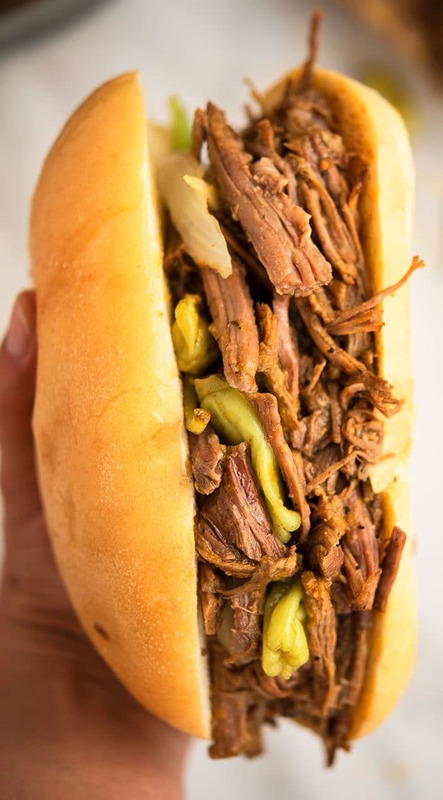 How to make Italian beef recipe/ Italian roast beef? Add onions, garlic, broth, pepperoncini peppers and juice, Italian herbs, red chili flakes, salt, pepper. Serve in hoagie buns and enjoy. How to make Chicago Italian beef sandwich? Dump piles of shredded beef on top of thick buns or rolls. Then, place a few slices of provolone cheese. Let the cheese melt under a broiler. Top off with some giardiniera and enjoy. Who invented the Italian beef sandwich? Is it really Italian? It actually originated in Chicago in the 1930’s by Italian immigrants. They would buy the cheaper, less desirable cuts of meat and slow roast it in broth and Italian spices/ herbs to make it taste better. The meat was then thinly sliced across the grain and stuffed into fresh Italian bread. It also started gaining popularity at weddings and parties because it was cheap and could serve many people. Now, it’s very popular at Al’s restaurant chains and Portillo’s restaurants. What is the best cut of meat for Italian beef? Inexpensive cuts of meat work well. Chuck roast is best because when cooked, it becomes so tender and melts in your mouth. Yo can also use sirloin steak or brisket. 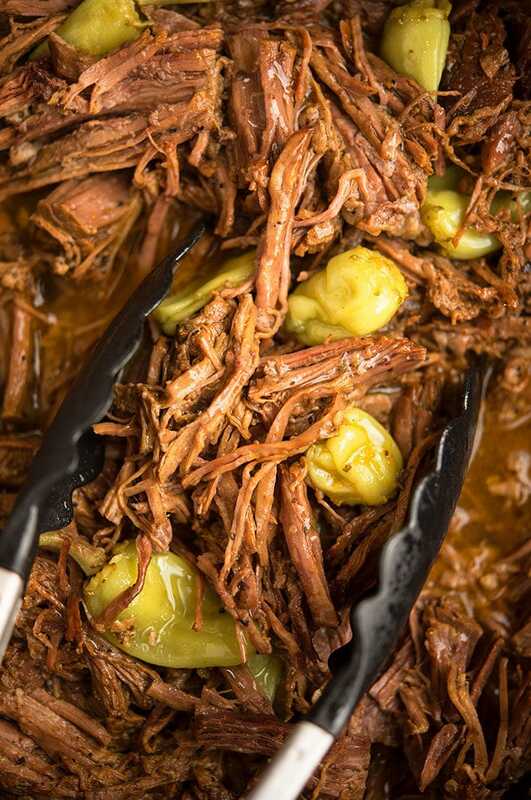 What sides to serve with Italian beef? Typically, it’s served on thick crusty bread or hoagie rolls with popular sides like french fries, sweet potato fries, potato chips and onion rings. You can also add toppings to the sandwich like provolone cheese or even some giardiniera (pickled vegetables). You can also serve the sandwiches with the “au jus” for dipping. Can you use frozen roast? The recipe below is for a thawed roast. However, you can use a frozen one but you will need to add about 20 minutes to your pressure cooking time. You will also have to skip the searing step. Use low sodium ingredients– This is especially with regards to butter and broth because it prevents the meal from becoming too salty. Cooking time may vary– This depends on the type of pressure cooker you use as well as a personal preference of how you like your beef. If it’s not tender enough to your liking, just cook for longer (up to 60 minutes). You must sear the meat- Because it gives it a nice crispy exterior and helps with the overall texture. Adjust amount of Italian seasoning– This is based on your preference. Add more or less. Make crockpot/ slow cooker Italian beef– Sear the meat and add it in the crockpot, along with the other ingredients. Cover and cook on low for 6-8 hours or on high for about 5 hours and then shred with a fork. Can you freeze pot roast? Absolutely. Once it cools down completely, store in a sealed air-tight container in the freezer for up to 1 month. Let it thaw in the fridge overnight before reheating in the microwave or stovetop. Make it spicy- Use hot peppernocini peppers and more red chili flakes. Shredding vs. Slicing- In the original recipe, a commercial meat slicer was used to cut the beef very thin and shave it but most people don;t have that at home don’t have that and shredding with forks works just as well and doesn’t affect the flavor at all. What to do with leftovers? Use them as a pizza topping or grilled cheese sandwiches. You can even use them in tacos and quesadillas. 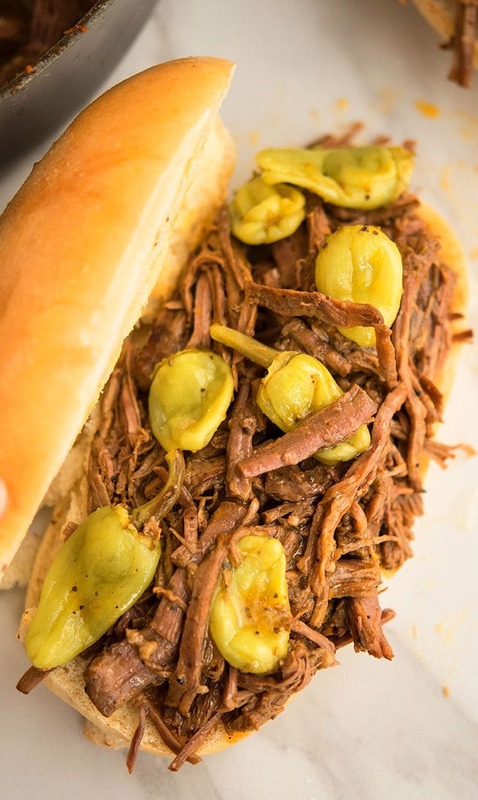 Tender, melt in your mouth, quick and easy Italian beef recipe, homemade with simple ingredients in Instant Pot. Great in classic Italian beef sandwiches. Turn Instant pot to “Saute”mode and heat butter and oil. Add roast and sear all the sides. Add onion, garlic and saute for about 1 minute until fragrant. Add broth, pepperoncini juice, pepperoncini peppers, Italian seasoning, red chili flakes, salt, pepper and mix everything together. Put the lid on and turn up the the valve to “Sealing.” Select “Manual” mode and set the time for 50 minutes. Note: If you want the “beef au jus” to be thicker, cook uncovered on the “Saute” setting until liquid is reduced to your desired consistency.